The new sQube® colloidal probe combines the well-known features of the proven Pyrex-Nitride probes series such as high application versatility and compatibility with most commercial SPMs with a reproducible sphere radius instead of a sharp tip. The excellent radius and the minimized variation of diameter provide reproducible signals. Pyrex-Nitride probes are designed for various imaging applications in contact or dynamic mode. 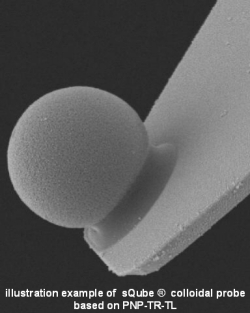 The so called "Colloidal Probe Technique", where single colloids are attached to AFM cantilevers for force measurements, opens the chance for a better understanding of fundamental interactions in a variety of fields. The Pyrex-Nitride probes have silicon nitride cantilevers with very low force constants. The probe series features a support chip that is made of Pyrex. The cantilevers are stress compensated and have a 65 nm chromium / gold backside coating for high laser reflectivity. Please choose A, B, C, D, or E when ordering! Only one cantilever with sphere, please choose also long or short! Colloidal probes based on PNP cantilever are not suitable for application in fluids. For this kind of application we recommend colloidal probe based on QP-CONT or QP-SCONT cantilever. All cantilevers are stress compensated and have a 65 nm chromium / gold backside coating for high laser reflectivity.